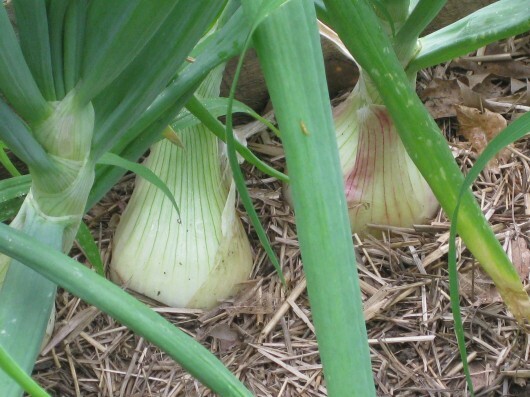 IF THE IDEA of growing a year’s supply of healthy, organic vegetables and herbs appeals to you, but the thought of digging through compacted, rocky soil does not, consider growing your crops as I do: in raised beds. 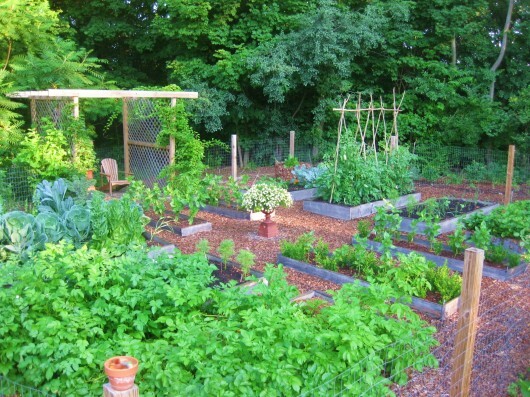 You’d be amazed at how many benefits there are to gardening “on higher ground,” and how easily beds can be constructed. You can build a raised bed from almost any material you like, as long as it is sturdy and does not contain harmful chemicals. Do not use pressure-treated lumber (including railroad ties) because it contains toxins that can leach into the soil. Bricks, cement blocks, and untreated lumber are all suitable for framing. Even cheap pine boards can be used to frame a bed. Pine, however, is not rot-resistant, so you’ll have to replace it after 5 years or so. The boards will last longer if you first paint them with raw, not boiled, linseed oil. I used untreated 1-by-10 inch pine for the beds in my Herb Garden (above). After one season the wood turned from boring beige to graceful gray. I paved the paths between beds with pea gravel, and then enclosed the entire garden with wire mesh attached to pressure-treated posts. For my kitchen garden, I built eight 4-by-8 foot beds from inexpensive, rough-hewn hemlock. Hemlock, like cedar, oak and redwood (these last two are pricey) is naturally rot-resistant. The boards of these beds are 12-inches high and 2-inches thick. Running perpendicular to the hemlock-enclosed beds are four 2-by-8 foot beds framed with 1-by-10 inch pine. Paths here are paved with shredded wood chips, and the garden is protected from woodchucks, rabbits, and deer by wire-mesh fencing. As for building a timber-framed bed, no carpentry job could be easier. Simply join the corners together with galvanized nails or screws. I used 1 ½-inch nails for my thin pine-framed beds, and 4-inch screws for my thicker hemlock models. Although corner posts are commonly used for raised beds, I have not found them necessary. 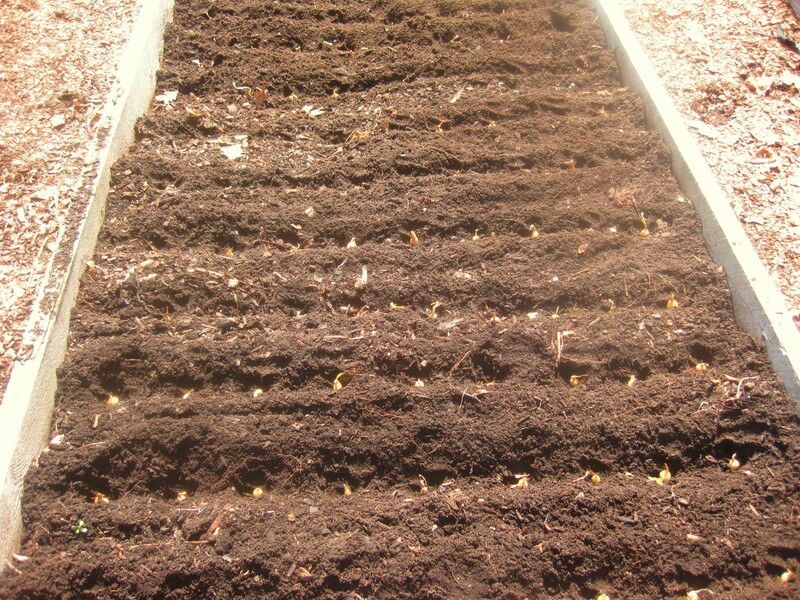 Before filling a frame with soil, it is imperative to line the bottom of the bed with either corrugated cardboard or several thicknesses of newspaper. This material will smother any weeds or grass that would otherwise grow up through the raised bed and impede your perfect planting plan. 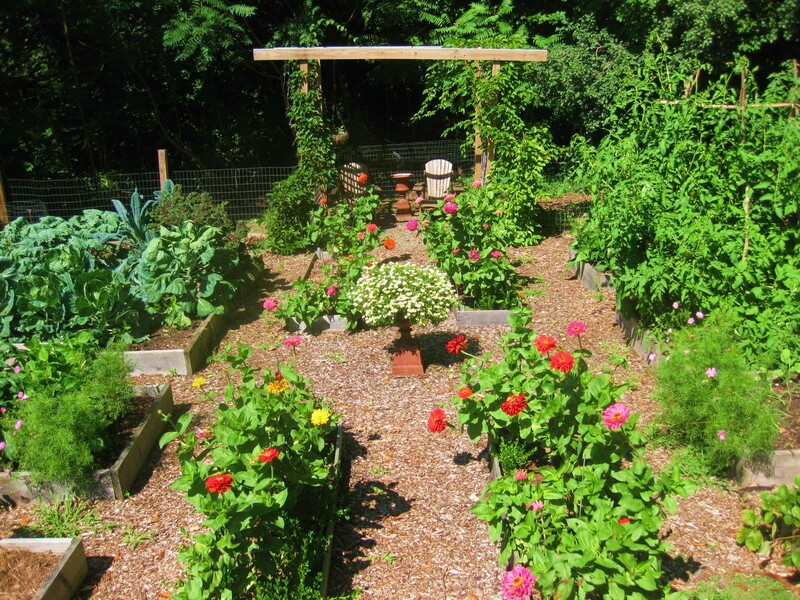 Of course, flowers love raised beds as much as vegetables do. I always plant zinnias in the long central beds of my kitchen garden; they attract the bees and butterflies necessary for pollinating my crops. They also provide beautiful bouquets for indoor enjoyment. A raised bed lets you garden in perfect soil. By “perfect,” I mean soil which is fertile, well-draining, and free of rocks and weeds. My own veggies flourish in equal parts top soil, composted manure, and sand. These components were mixed and delivered by a local farm. I’ve known other gardeners who fill their beds with packaged mixtures obtained from the garden center or hardware store. To insure ongoing fertility from year to year, and to avoid the need to purchase additional soil to refill the beds as settling occurs, I top my beds off each fall with shredded leaves. As the leaves decompose over winter, they add vital nutrients to the soil, and improve its water-retention. 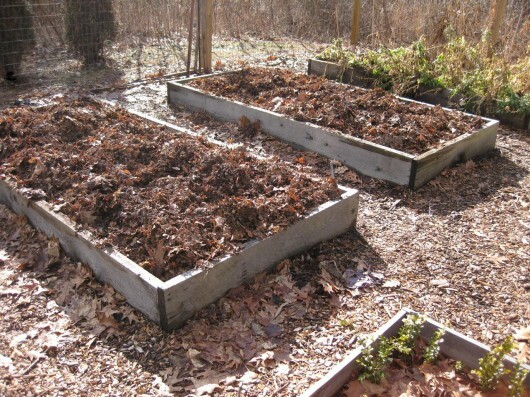 Soil in a raised bed does not become compacted. Why? Because it is never walked upon. Unencumbered by rocks or hard clumps of soil, root vegetables like carrots and parsnips grow straight and long. Beets, turnips and onions (that’s my beloved ‘Copra’ above) grow into the beautiful globes depicted on their seed packets. If you suffer from a bad back, you will appreciate being able to plant and harvest your vegetables without bending deeply. In fact, if you build your beds high enough, you won’t have to bend at all. If you limit your beds to 3 to 4 feet in width, you will not have to reach excessively, either. Because plants can be grown very close to each other in a raised bed, even a tiny yard can support a lavish edible garden. The four 6-by-4 foot beds in my small herb garden, pictured above, produce copious quantities of parsley, thyme, and other aromatics. I pick these herbs at the peak of their perfection, then freeze them for winter use. A raised bed vegetable garden has less weeding, less bending, and absolutely no tilling—there are really no negatives to this type of gardening. Well, none that I can think of, anyway. Let me know if you’re a fan of gardening “on higher ground,” too. What Would You Plant in Your “Subsistence Garden”? I’ve been wanting to do a few “raised beds” in my vegetable garden, but mostly to give me some level garden beds in my very sloped garden. I’m thinking about doing several 3’x3′ beds made from 2×12’s. One side would likely be burried to ground level and the other side would probably be exposed completely (12″). I know that I won’t be getting all the benefits of a raised bed, but I think it will be a lot easier for me to tend to. I’ve been putting off the project because of all the post hole digging and expensive cedar, but I think I’ll give your oiled pine & no post method a try. The biggest “mistake” I’ve made in my garden is that I have grass walking paths between the beds. Looks nice, but creates extra work and, I suspect, extra weeds. Your walking paths look great. I might have to switch to mulch (I don’t think the gravel would work on my slope). Really enjoy seeing photos of your gardens — very inspirational! I have one raised bed that was made from fence boards. It’s on its 5th or 6th year now and while it’s deteriorated some I think it has at least another year or three before I have to replace the beds. I’ve been saving bricks from a lime kiln at my husbands work. Besides having a lovely rustic tumbled look they’re stained all shades of red/orange/yellow. I think they’ll work well for more raised beds. I’m having an issue though, our yard faces SE (or SW, I’m tired and don’t have the map handy at the moment) so if I design the beds to parallel the fence, property line and road the backs of the beds don’t get quite enough light and a lot of my plants lean, if I set them up to face south they’ll look off kilter and won’t use my land efficiently. Quite the conundrum. brenda – Another great aspect of pine is its extra-light weight. I required no help to build the pine beds for my herb garden. If you’re handy, you can cut shims to level the end of a bed that’s on a slope. I smothered the grass (well, weeds) between beds with thick layers of newspaper. The newspaper was then topped with mulch. Straw works well for “pavement,” too. Enjay – Always tricky to find the “perfect” spot for veggies. Maybe plant low-light-tolerant lettuces and other greens on the shadier side of your proposed site? What a stunning and intimate look into your gardens. That hemlock really looks great. I have untreated plain ol’ lumber at the moment, and on it’s third year termites have already scavanged into the moister parts of the garden beds. I am thinking of brick or concrete as a permanent solution – the brick may look really nice paired with my colonial styled home. Donna B. – Thank you for that too-kind comment. The brick beds you mentioned would be not only durable — but beautiful, too. Your garden is beautiful. I use raised beds also because our “soil” is crushed granite. How do you water your garden? Do you have a watering system or do you hand water? Or, are you lucky enough that Mother Nature provides most of it for you? In the spring of 2010, we (my husband, son and I) put our entire vegetable garden into raised beds–20 beds, each 24 by 4 feet–they are subdivided at the 12 foot mark. We used 2 inch cedar from a local mill, and even though it was a lot of work and cost a bit, it has been soooo worth it. Our drainage was terrible in places and the summer before we built them (rainy 2009), our harvest was pathetic–now we can hardly keep up with the production. We also have a very low-tech hoop house over three of the beds. We move it every fall, so it cover tomatoes, peppers and cucumbers in the summer and greens and leeks all winter. I then get an early crop of spinach, turnips, radishes and various other greens before it is time to transplant the heat lovers. We have had vegetables since early March! I dream of a veggie garden like yours! It’s so beautiful! Rosemeri – I water by hand. But I water less than you’d imagine. The shredded leaves, which turn into leaf-mold, hold 80% their weight in water. Mary – You were so right to build a raised bed. My soil is awful, too, and when I gardened “at ground level,” the annual rental of a roto-tiller, plus constant weeding, and occasional flooding were just too much to bear. 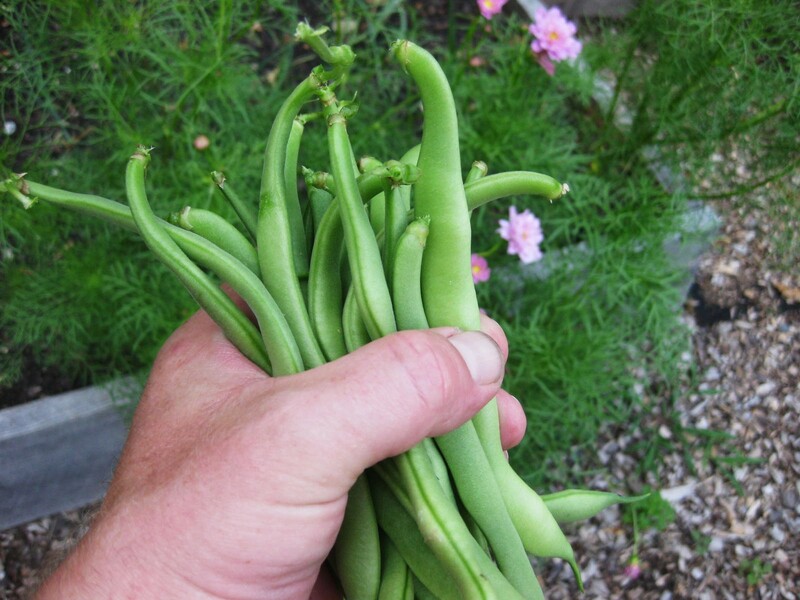 Like you, I saw my harvest increase dramatically when I switched to raised beds. Erin – If your skill with flower-arranging is any indication, I’ll wager you can come up with a smashing design for a raised bed veggie garden. Thanks Kevin, actually I’m doing round beds and using wagon wheels laid on top to separate the veggies from each other. I’m keeping my 4×4 beds until I’m done constructing them. Wonderful post, thank you for sharing, I really like the rough sawn thick boards you used. I don’t hear much mention of Redwood for raised beds. Is there a reason do you think? Erin – Wagon wheel sounds like a fun idea. garden raised bed – Nice to meet you. Redwood is mentioned in paragraph #4. Forgot to mention oak, another good rot-resistant wood. Correction made. I just love all the photos of your gardens… 🙂 I have a 4×12 (I think) raised garden, split into 2 sections. Half is devoted to potatoes this year (so excited! I also am trying a potato tower: http://urbanfarmerseward.posterous.com/potato-towers-and-living-fence-posts for the extras), half is root and leafy veggies. It doesn’t get quite enough sun to make tomatoes happy, so they’re living in pots this year… The wood came from an old garage, perfect, straight, thick boards (and no pressure-treating)! Gen – Glad you like the photos. You’ll have to let me know how that potato tower works out for you. Great step by step instructions, my son Marc in New Hampshire is starting a garden this year, I’m sending him your how to, it’ll be very helpful. One question: what would you recommend to deter deer, Marc lives in the country where the critters are abundant. As always, thanks for your great site. 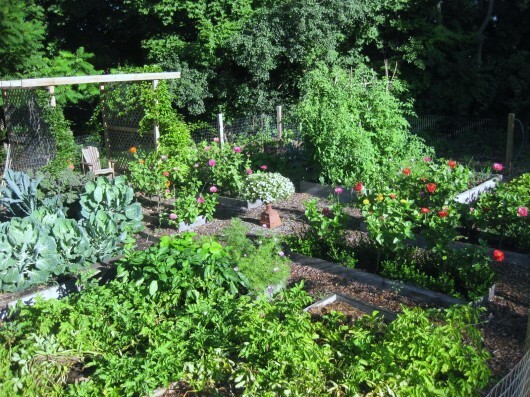 Bonjour Oriane – My Kitchen Garden is located next to a forest. A forest filled with deer, rabbits, you name it! But the 4-foot tall, wire-mesh fence that I placed around the garden keeps all the critters out. I have a question about your comment in paragraph 6 concerning lining the beds with newspapers. I am concerned the vegetable roots “need” more depth ie okra with the long root. Since the beds are planted with the plants closer together, I thought there would be less area available for the roots if the newspapers limit the depth the roots could grow. My estimation is that the raised bed will have approximately 10″ of depth, assuming one doesn’t fill the bed completely. Have you experienced any issues with the newspaper lining for vegetables with a long tap root? Also, I read your comment about refilling your beds with leaves and how the leaves help with water retention. I live out in the open prairie with little to no trees. Is there another substitute you could recommend? Hi Chanda. Roots of plants will have no trouble penetrating the newspaper at the bottom of the bed (should they extend that far). Damp newspaper deteriorates very quickly. As for a substitute for leaves for topping-off your beds in the fall, you will probably have to rely on compost — either your own, homemade, or that obtained from a garden center or local, organic farm. Thank you, that is great news. I have been having the worst trouble with Bind weed. I have been trying numerous ideas with no lasting effect. The next bed that goes in will be lined. By the way, I like your flower beds in the kitchen garden. I am adding to the number of milk jugs I need to collect for winter sowing to include flowers for the vegetable garden next year. Kevin, Can’t you use grass clippings over the garden in the fall, if you don’t have leaves? I used to put grass clippings in the valley between my raised rows (I had wonderful soil in VA) and once it dried out would spread it around the plants. My garden was amazing and it helped keep the weeds down. Chanda – Good idea to start collecting those milk jugs now. Anne Shea – Yes, grass clippings (from a lawn which was not treated with chemicals) are great to add to beds in fall, or to keep weeds down during summer. When I was a child, my parents used grass clippings to mulch between rows of their “in ground” veggie garden. The clippings did wonders to enrich the soil. I’ve used raised beds for years, in my home garden, in my Boston community garden, and now in my Vermont garden. Can’t imagine gardening any other way. We have 8 4×8 raised beds, mostly made out of scrounged untreated 2x8s, plus a few smaller-sized beds scattered around …Learned the hard way that 4ft wide beds can’t be any longer than 8 feet, or I’ll cheat and walk across them, thus defeating the “no stepping on the soil” rule! Plus, the wooden frames make it easy to attach trellises, hoop houses and other covers to extend the season. We primarily use the square-foot method, dividing the beds with wooden lathe strips and it looks great and helps me remember to plant intensively. Thanks Kevin, I’ll tell Marc about the fence. 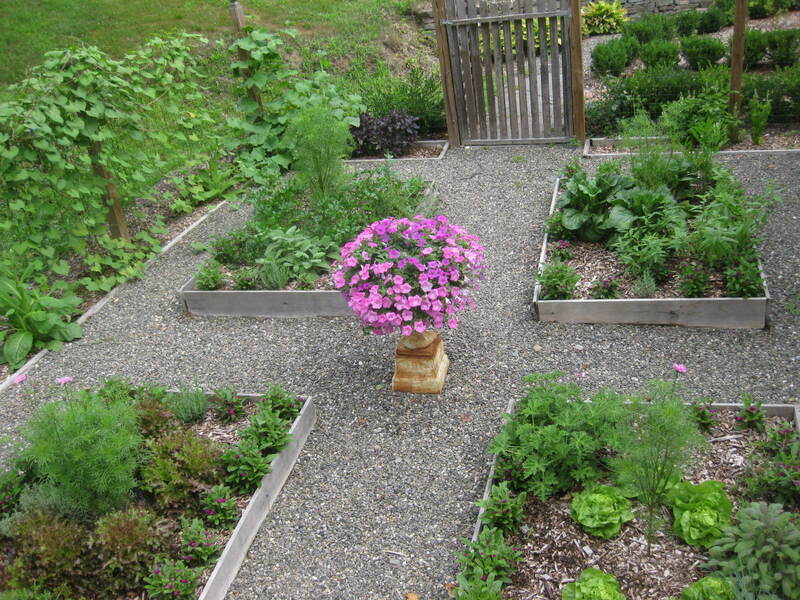 You are so right, it’s much easier to garden with raised beds. When I moved from Washington State to South Florida, I invested in a bunch of GrowBoxes to grow my crops in. This February, I finally decided enough was enough and turned about a third of the yard into a raised bed garden with four 4’x8′ beds. It’s on a 12″ berm, so it’s spectacularly set-off from the rest of the yard. The GrowBoxes now house my herbs, exotics and native plants I’m starting from seed. Luckily, there’s enough space left on the berm to add a few of these 2’x8′ beds so I’m looking forward to growing more tomatoes and other tall crops this fall. Nothing grows well in the summer down here so my planting season is over except for beans and malabar spinach. I love the pictures of your garden. I’ll share some of mine once it’s completed – I’m still working on it three months later… 🙂 I’ve been enclosing the berm with cinder blocks and plan to put up a grape trellis on the east side. It’s definitely a long-term project! Thanks for sharing your gardens with us. Yes, raised beds are the best! Thanks again for all your wonderful sharing. Your page is pure pleasure without saying very practical. I still haven’t figured out though how you “shred” your leaves? I’m a lazy—or maybe just overwhelmed—gardener. I assembled my raised garden about 7 years ago and it’ll probably outlast me. Home Depot and similar stores sell galvanized steel retainers for basement windows that are below grade. They come in 12″, 18″, 24″ heights. I bent the flanges and bolted 4 together to make a raised bed. It’s easy. It’s modular by nature, so you could make different configurations to fit just about any need. My 18″ bed is approximately 20 square feet and cost about $80. The sides are corrugated, weather to a soft grey and are reflective enough to pick up the greens and whatever other colors are nearby, so it’s a quiet presence in the yard (and the rabbits haven’t figured it out yet). This may not be clear but a photo would explain it instantly. If anyone is interested, email me and I’ll send you a shot. Maxine – You are right about the wooden frame — easy enough to turn into a hoop-house for lengthier growing season. Oriane – Today, 90 degrees in the Hudson Valley. I can’t imagine your Arizona heat! Lise GB – Like you, I mulch my raised beds with straw (or shredded leaves). Good soil plus mulch equals less watering. And great to have that double height, right? Caroline – Nice to read about your raised bed design. The 2×8 boxes are very practical — and there’s zero reaching with them. Yes, send photos to [email protected], or post them on my Facebook page. Noelle – Back in 2008, I purchased something called the Flowtron Ultimate Leaf Shredder. Great gadget! Weighs practically nothing, so even a weakling like me can carry it from place to place. You simply plus it in, dump in your leaves, and out they come, shredded coarsely or finely as you please. It is one of the few items I advertise on this site, because I love it. You can see the product on the right-hand side bar on this site. 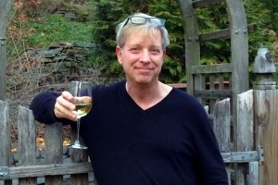 Bill DeHoff – Nice to meet you. What a clever idea to use galvanized steel retainers for raised beds. Durable indeed, and I can imagine one bed reflecting the greenery from another. Yes, send a photo to [email protected] (or post on my Facebook page). betsy – The four-foot tall wire-mesh fence around my garden keeps all the woodland creatures out. You asked about moles and voles. I’m not sure about voles, but moles eat grubs. To eliminate the grubs — and consequently deny the moles their food source, apply milky spore to your lawn/garden. Milky spore is a completely natural, safe, organic substance. You can find it in most garden centers. Hello again…Mr Jacobs! Great advice re: the milky spore…thank you!! I’d be interested in seeing Bill’s pictures of his galvanized steel frames….I’ve been thinking of using galvanized steel roofing (of the corrugated type) which is very inexpensive. It isn’t modular, but is available in 8′ x 24″ sheets and would require some wood framing for support. I laid out my kitchen garden yesterday with a can of spray paint and am ready for construction! Thank you for the inspiration :] My question to you is: how do you prepare your beds for winter to keep seeds from germinating in the soil and how do you keep your pathways weed free? I too LOVE raised beds. My entire 2 acre landscape (including my veggie garden) is done in raised beds. The soil is awful here in NC (clay and rock). Plus I could not grow anything under all the trees in my front yard, so I created my woodland garden. After 10 years of planting and weeding and mulching with all my leaves, it really looks great. My veggie garden consists of 6 beds (approx. 4′ X 6′ each) and 2 large compost bins in the back..(made from old pallets) and a couple of rain barrels that catch water off the roof of my shed. I too water a lot of the plants by hand as the rain barrels and my watering can are so close and convenient. I have faucets on the bottom of each rain barrel, but I like the act of hand watering. It lets me enjoy my labors. Joelle – I’d ask the hardware store this: “With what has the wood been treated?” If the answer is anything other than raw linseed oil, I’d proceed with caution. 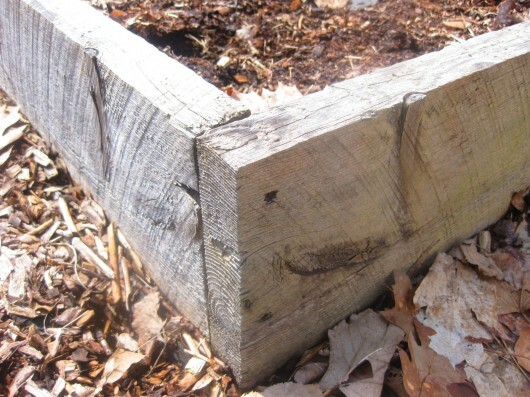 When it comes to raised beds made from wood, it’s best to use UNtreated hardwood. Otherwise chemicals can leach into the soil. For the raised beds in my Kitchen Garden, I bought rough-hewn hemlock from a lumber store. Remember you can make the beds from untreated pine, too. I used the cheapest pine possible for the 4×6 raised beds in my Herb Garden. 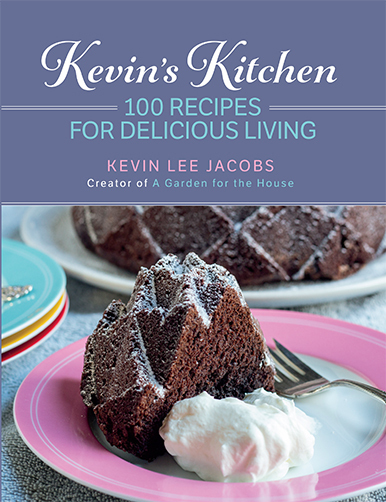 Kevin, I’m new to your site and loving your info on gardening and the healthy recipes! Since bending is hard on my back, I was wondering how building a raised garden on an old wooden picnic table would work out. Any suggestions? Mary – Nice to meet you. I think a raised bed set atop a picnic table is a great idea. The table is probably 28 (or so) inches high. Add another 10-12 inches for the raised bed, and, depending on how tall you are, you probably won’t have to do any bending at all. My only advice is this: Be sure to staple landscaping fabric to the bottom of the raised bed before hoisting it onto the table and filling it with soil. The fabric will let excess moisture escape, but it will stop the soil from washing out. Hello Kevin. I just found your site and am glad I did. I have a long flower (approx 22 feet) and ornamental grass garden in a sloped (not too steep) area alongside my house. Everything generally grows fairly well however maintenance is a lot of work and my dogs love running through the plantings. I’ve considered a number of options and want to convert to a raised garden bed – it would make the garden much more beautiful. Could you clarify your instructions for the frame construction – how deep into the ground can a board can be inserted on one side to make the bed level. Or should two different height boards be used so there is a limited amount of board in the ground? Will the newspaper work with flowers and ornamental grasses? And, how do I “heighten” the existing plantings into the raised garden bed (the plants will stay in the same approximate location – their “sloped” bed would just be converted to a raised bed. How deep would I need to make the raised bed to accommodate flowers and grasses? I have shredded leaves from last fall – can be used as mulch on top of the raised garden bed soil or should I work the shredded leaves into the soil? And a final question, the trellis in your garden is exactly what I am looking for – can you advise on its construction? As much info that you can provide would be really helpful. I’m a new gardener and just learning. PS Is there another area on your site that gives step by step instructions for the raised beds or is the narrative with the pictures the instructions? Again I’m a novice gardener, have just found your sight and need all the help I can get. Thanks so very much. Meeri – To prepare my beds for winter, I mulch them heavily with shredded leaves. The leaves replenish the soil, and definitely reduce the number of weeds which emerge in spring. There’s always a few weeds to pull, but never an entire crop. To mitigate weeds in your pathways, consider lining the paths with thick layers of newspaper, or for longer-term, landscaping fabric. Then pour whatever paving material you choose — gravel, shredded wood, salt hay substitute — on top of the paper or fabric. Not a fool-proof solution, but the lining really helps. Joan – The four foot fence has worked well for me. I’ve watched deer walk around the garden, but make no attempt to enter. Gladys – Love the idea of having rain barrels in a kitchen garden. Bea – Yes, you can dig shredded leaves into your beds to make the soil more water-retentive. You can also use shredded leaves as mulch on top of the soil. Your flower and ornamental grass border sounds lovely, and I do understand the issue you have with dogs running through it! Alas without my being physically present on your property, I can’t advise on how, exactly, to best transform that border into a raised bed. I’d consult with a landscape architect — he or she can tell you exactly how to proceed with your plan. Thank you Kevin for the info about the leaf shredder. I saw the ad. Sounds great. Thanks again also for all your tips and wonderful advices. My big problem these days is DEER. They eat just about every new shoots around my entire garden. They love roses especially. I bought some “scented” gadget that’s supposed to repel them, but it did not do a thing, even when I attached the gismo right on a branch of the rosebush. Do you have any suggestion? My biggest question regarding raised beds is crop rotation. Do you find the need to rotate or does just adding new organic material take care of the problem? These are great directions. Thanks for keeping it simple and inspiring me to get out there and create a gorgeous garden of raised beds! i have used everything from discarded bookcases, drawers, dismantled church pews, wheat straw bales, to build raised gardens. i am always looking at what is on the roadside for recycling…newspaper attracts the earthworms and discarded windows…..very useful, any fencing is fair game for climbers and broadcasting seed at end of season gave an early start to spring greens…just go for it….love your site! Noelle – When push comes to shove, only a fence will deter deer. But what an expensive proposition if you have a large property (which I suspect you do). My edible crops (because I refuse to share them) are all located behind 4-foot tall wire-mesh fences. Irene Harper – Even with raised beds, crop rotation is absolutely necessary. If you look at pictures of my veggie and herb gardens, you’ll notice that each year I plant my crops in different beds. Good idea to keep a diagram of what went where each year. Cindy Black – Have fun with your raised beds! marilyn harrison – Couldn’t agree more with your raised bed-philosophy. My horticulturist friend warned me against using grass clippings and dead leaves in my beds without composting them first, because they rob the soil of nitrogen as they decay. I mulched the leaves and put them on the beds over the winter, but she encouraged me to remove any that had not broken down. What are your thoughts on this? A few years ago I razed my back yard. As I recreated it, I made an 18×18 mulch square, with 4 4×5 raised beds. In the center of each bed I put an irrigation system sprinkler head, and the entire vegetable bed is on it’s own zone. I thought I was very clever with such an efficient watering system, but now regret that decision, primarily because I lose a lot of space for plants in the center of the beds, but also, as you’ve mentioned, the vegetables shouldn’t be watered from overhead with anything but rain. waah! Along that note, you’ve mentioned that you can plant plants closer together in raised beds. Why is this, and how much closer do you really plant them? Kay – While un-composted wood chips will rob the soil of nitrogen, grass clippings, I feel, should not be a concern. In fact, grass clippings left on a lawn after mowing will fertilize the lawn, and help it to stay green. On the other hand, a thick mulch of grass clippings placed on a garden bed can become matted when wet, and keep moisture from reaching the soil below. Ditto for whole leaves. Shredded leaves are never a problem. I place shredded leaves in my garden beds every autumn, and have seen only positive results from the practice. A commercial greenhouse I know grows lettuce in pure leaf-mulch which is not completely composted. And in summer, it is my habit to mix partially-composted leaves with soil for my container plantings and hanging baskets. The leaves hold a good deal of moisture, so the containers require less frequent watering. As for plant-spacing in a raised bed, my policy is to plant closely enough so that the foliage will completely shade the soil. If the seed packet says “space 12-18 inches apart,” I always go with the lesser number. Plants like onions and leeks are an exception — their foliage can never shade the soil, because it grows up, not out. Kevin, I am reclaiming what was an old veggie garden from wire grass. Years of healthy growing wire grass. I have just about freed two old beds, but thought I might build a couple of raised beds…it has so hard to screen out the wire grass bit by bit from the soil. Do you think it might be workable to put down newspapers in a heavy layer then then put the bed and new soil on top? I have used the newspaper and mulch technique before at other homes with great success. But those I cut a hole and planted through the newspapers. How deep should the bed be for veggies on top of the newspaper? Thanks for any help! Hi there!!! I just love this site, as I have been working with raised beds for some time now. I read the Lasagna Garden Book the first time I had known about this kind of gardening. It is a wonderfully written book, and it makes black gold for you. My husband built for me a handicapped raised bed. It is 3.5′ wide by 10′ long by close to 4′ high. It is doing really well right now, but will see as the growing season goes on. The last place we lived we had raised beds with old metal roofing sheets held up with wooden stakes. We did it layering per the lasagna method. I grew buckets and buckets of food with 5 gardens about 12′ long. After 3 years the soil was black anc fluffy. Wow, I hated to leave it. Anyway, just thought I had to chime in on this wonderful site. As we all know, the first step in good gardening, is Great soil!!! Cilla – I’d go ahead and smother that grass with thick layers of newspaper. Concerning depth of raised bed — most veggies are happy to grow in 8-12 inches of soil. Tina – Nice to meet you. Yes, great soil — however you achieve it — is the first step to gardening success. Some of us have to learn this fact the hard way! What can I say except that I really appreciate your site, even though I live in Qld., Australia, your tips are still very helpful. Hi Dana – I guess gardening is a universal language! The first time I built a raised bed garden (years ago) my husband thought I was crazy. While that part is debatable, the raized bed garden proved to be not only a good idea, but a thing of beauty for the neighbors to admire. We moved and I built another one. This time my neighbor thought I was eccentric – stating that I would have more lumber in the garden than soil. He admires my garden now. I used 5/8 x 6 lumber because that was cheaper – though I think not in the long run. In any case, that can be done. I thought about replacing it with the 1″ concrete blocks, but I think it would be cheaper to use 2×12’s. One thing I like about raised bed gardens is the ability to change the ph level in different beds for different plants. I really enjoyed this article – and the pictures were great! Good morning all, thought I would chime in. In the interests of always looking for ways to conserve water, I think my next garden beds will actually be wicking beds. Have looked at tons of youtube video and I really like the idea. Basically, put a french drain piped down on pea gravel (and of course cardboard/newspaper) then cover the drain with sand. Atop that lay an old blanket or landscape material the put in your growing soil. I will add, that an elbow needs to be attached to the drain with a pipe stick up that will accept a hose. A drain hole should be added on the end of the garden bed for run off. Anyway, once the bed is complete and the veggies planted, apply water through the pipe that sticks up. Water will drain through the french drain, applied to the roots and voila! You save tons of money on watering and reduce the number of days needed, depending upon your climate. I might add one other idea. Do not forget the Habitat for Humanity stores for reclaimed everything, especially wood. Just wanted to throw my 2 cents into the mix. Hope everyone has a great day! Beauitful and inspirational garden. I am planning a few raise beds on my terrace as i don’t have a yard. You think it will work? The roof has been treated for water leakage already. Plz advice. Raised beds are great – I have three and they are very easy to maintain and get very few weeds. I would like to put in two or three more soon. I have been looking over raised bed configurations for myself these last few weeks and I really like how you have set yourself up. Wonderful job! I would be interested to know what plants I can incorporate into my garden that will discourage predators (insects and animals). Last year I successfully used marigolds to fend off the local rabbits. Hi! I am in the process of converting my large garden into raised beds. I’m very confused, though. Some sites say do not use pressure treated lumber, some sites say it’s okay due to the new regulations since 2004. I called the Michigan State University Extension Office and they said it was okay to use pressure treated would, but the lady recommended that I line the edge of the bed with a tarp or plastic. What are your thoughts? Hi Michael – Here’s a list of companion plants for pest-control. Sheri – I, personally, would not use pressure-treated wood without first knowing which chemicals were applied to the wood. And even then, I’d have to feel mighty confident about the safety of the chemicals. No worries with untreated, naturally-rot-resistant hemlock (which I use), oak, redwood, and cedar. Ordinary brick is great for raised beds too, and if properly mortared, will last and last. As for the plastic lining that MSU extension suggested for pressure-treated wood? Well, the very suggestion raises red flags for me. I am tickled pink that I found your site via Pinterest! I have fibromyalgia but still want to garden desperately, and your ideas are helping me do just that! I am encouraged by the ease of the raised bed construction and will be attempting it in my country garden. You have lovely gardens and I am looking forward to reading many more posts on creative, EASY ideas to still have a lovely garden! Hello! I was thinking garden raised beds in the yard were doomed to be visually boring until I ran across your blog on Pinterest! I love the slender beds you grow for flowers–that is just the idea I needed to add to my blossoming raised bed garden (2 built, many to go!) I am going to “steal” your idea and make them in the middle with a nice pedestal planter as well. Beautiful ideas all around. Saved to my favorites! Thanks. P.S. I love the pretty arbor too. Can I line the bottom of my raised bed with a layer of plastic before I put the dirt in? Hi Sandra – I wouldn’t use plastic beneath the raised bed, as it will interfere with drainage. But you can certainly use cardboard or a thick layer of newspaper. I just wanted to Thank You for sharing your weed killer recipe , using white vinegar , salt , and a squirt of liquid dish soap. I will report it killed my green weeds , and now they are dead brown weeds. AWESOME!!!!!!!!!!!!!!!!!!!!!!!! A customer of mine emailed me and mentioned your website and I have to tell you that I just love what you have done. You website is lovely and your knowledge and love of gardening, and everything (actually) is so refreshing. Congratulations, you have done a great job. Mizz Tizzy’s Weeds and Seeds. I BUILT TWO 6X16FT. RAISED BEDS AND TWO 4X4FT. RAISED BEDS LAST YEAR AND LOVE THEM.THIS IS MY FIRST YEAR GROWING POTATOES IN ONE OF THE 16FT.BEDS.hOPE I GET A GOOD HARVEST.I ALSO HAVE A “IN GROUND ” GARDEN WHICH NOW NEEDS TO BE REFURBISHED WITH COMPOST BEFORE PLANTING ANYTHING. WHAT DO YOU RECOMMEND AND THE BRAND AS I’M GOING TO HAVE TO PURCHASE IT FROM A HARDWARE STORE OR A LANDSCAPER[I KNOW ONE WHO SELLS IT BY THE SCOOP LIKE HE DOES MULCH. THANKS THIS ARTICLE WAS SO INFORMATIVE AND PHOTOS ARE BEAUTIFUL!!! How do I prevent termites? Thank you Kevin! I have now found how to make raised beds! I am so excited… one more project for my garden. And Kevin thank you for sharing your new picture… lookin’ good! i’m on a brook…and i had to go find my plants in the the woods and a week later…another flood which left the plants under water for 12 hours. I was wondering were you got the hemlock for your raised beds? I live near Valatie. Thanks for the wonderful blog! I enjoy reading it each week! Hi Leo – I purchased my rough-hewn hemlock from Ghent Wood Products on Route 66. As I recall, they delivered the lumber about 1 hour after I placed my order. I have used cement blocks to build a garden. The ones with holes and I stacked them with the holes upward. I have stacked them 3 and 4 tall approx 4 x 6 feet each. I currently have 3 sets together in a row. The first is my compost pile the other two are for vegetabes. I have also used the holes, filled with good soil and plant in them. I plan to extend it even further. When my compost is ready I just transfer it to the beds. I have had great success with this layout and very easy to maintain and it will last a very long time. Thanks Kevin for a great site. 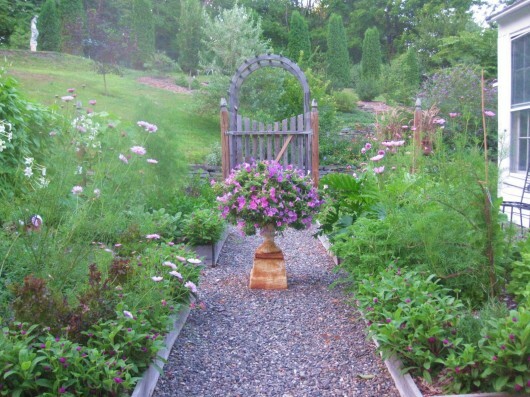 Hi Jeanette – Cement blocks are terrific for raised beds. Good for you! I am wondering how your galvanize window well gardens are doing and if you would send me some photos of them. Love this idea! I’m in the process of putting in some raised beds now but mine will be about 3′ high and the container will be a kind of brick window box. Anything you can recommend would be helpful! This post, plus all of the comments (hello everyone) have helped me solve the problem of a funky shape in my yard. We have a long flat section that runs the length of the house, then a short sloped section, then another flat area (it used to be a swimming pool). The sloped area is a pain in the patoot to mow! By spring, it will become a long raised bed that will be home to flowers! Thank you for the spark for this idea. Along the end of these long sections, previous homeowners put in a long, sloped, partially raised vegetable garden. I think a series of three stepped beds might look a little less disorganized, and provide me with a place for my planned sugar pumpkins and zucchini. Everybody in town had better keep their cars locked next summer! Finally, thanks, Kevin, for the tip to use newspaper and cardboard to block weeds. We just moved into this house and have a ton of cardboard boxes as well as a ton of weeds. Kevin: you are a Garden Angel!! I have enjoyed my veggie garden for at least 30 years and loved every minute. Every day in the garden is interesting. This year, I will update and build raised beds. I know there are millions of raised bed and veggie gardening books, I (and I am sure others as well) would love if you wrote a book on these subjects with photos. There are millions of cook books, and you wrote one that was FANTASTIC and helpful. Please consider. Thank you and happy gardening. thank you for the how to do it reminder! April in North Texas, the herbs are out of control! Thank you for the reminder that we can freeze them. I will be trimming them back mightily this weekend. Any very easy hints on how to grow climbing things like black eyed peas? Two stakes in the box with string between them???????? I live in the San Joaquin valley of California. I should be able to grow tons of veggies. I have raised beds and the last few years I have had a terrible problem with earwigs nearly destroying several plantings. I want to grow organically and have tried various suggestions to no avail. Any ideas on how to get rid of these awful critters? I used treated wood but wrapped it with plastic so chemicals can not leech in soil. Oh my goodness! This is what the raised gardens in my dreams look like. Do you have any suggestions on how to do the beds and the walkways in the context of gophers? I have the space and the climate in southern California but this year I have gophers gone wild in my back yard.